The traditional image of the British hero is a man (almost invariably) who is firmly part of the Establishment, which he embodies through everything he does. Sanders of the River (1935) runs his African mini-empire as though he was its schoolmaster, while even James Bond performs his various acts of heroism for Queen and country, most vividly depicted at the start of The Spy Who Loved Me (1977), when his seemingly fatal plunge off a cliff is stalled at the last minute by his Union Jack parachute. The British stiff upper lip is even more in evidence in countless war films, especially those set during World War II, when the need to defeat Nazism united the country in a common purpose that it has rarely seen since. Regardless of whether one was actively fighting the war (In Which We Serve, 1942) or providing vital back-up at home (Millions Like Us, 1943), public stoicism was all-important and emotion only displayed in the most extreme (or private) situations. 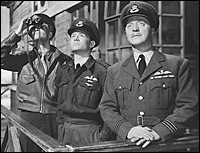 The Way to the Stars (1945) provides some particularly good examples, as the film explicitly contrasts British reserve with American exuberance. The same attitude can be seen in a slightly different domestic form in Brief Encounter (1945), where Trevor Howard and Celia Johnson's heroism derives from their decision not to give in to their natural impulses and destroy their marriages by running away together. Conformity with what British society considered acceptable was more important than following individual desires, even if this involved making huge emotional sacrifices. Dated and much-mocked though this stereotype might seem, it is far from dead, as Hugh Grant's career demonstrates to perfection. While his characters are generally more impulsive than his filmic ancestors, they're nonetheless just as (self-)conscious of the impression that they're creating. Though the British Empire is long gone, and its parent a mere shadow of its former self, Grant has become a major international star by embodying the most appealing (if occasionally infuriating) British virtues: what his characters lack in spontaneity and verve they more than make up for in reliability, solidity and basic decency. And at a time when British society is more fragmented than ever, this in itself can be seen as authentically heroic.